DIAGRAMMING THE PLEDGE OF ALLEGIANCE by Francis Bellamy I pledge allegiance to the flag of the United States of America and to the Republic for which it stands, one nation, under God, with Liberty and Justice for all. 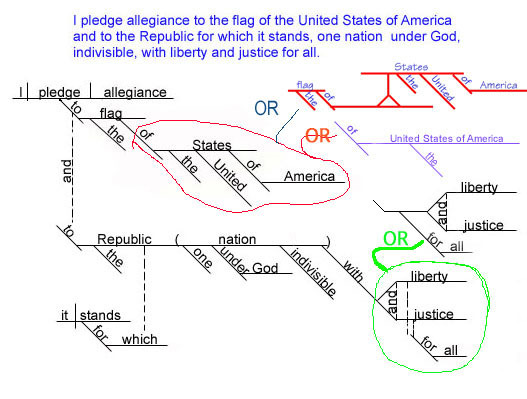 The diagram is of this Pledge language: "I pledge allegiance to the flag of the United States of America and to the Republic for which it stands, one nation under God, with liberty and justice for all." Another way of diagramming the two major prepositional phrases (beginning with "to") would be to put them both under "pledge" and to connect the two to's with a horizontal dotted line with "and" typed above it. That would lead to a very wide diagram. An earlier version of this diagram included the prepositional phrases under "allegiance," but Dennis Beach (of St. John's University/College of St. Benedict in Collegeville, Minnesota) believes that they properly modify the verb "pledge." Mary Steele has made other helpful suggestions. The final prepositional phrase, "for all," is diagrammed in such a way that it will modify both "liberty" and "justice." Another interpretation is that the phrase is meant to modify only "justice" and, if so, then the phrase will be attached to the horizontal line below that word and there will be no dotted line to "liberty." Some people would put "the United States of America" all on one line, since it is, indeed, one proper noun. This is probably correct, and it is shown as an option below. In the original version, the country's name is shown as one word, "States," with accompanying modifiers. Ann F. Reyna suggested that "States" should be placed on a pedestal which would allow placement of modifiers under it. "One nation. . . " is regarded as an appositive for "Republic" in this rendering. There may be alternative ideas for the placement and function of "for which it stands" (or of the entire sentence, for that matter).